Let's face it, the animation and art style were the two things that really drew me into this show. They were able to combine elements from lots of different movies and make it into something unique. 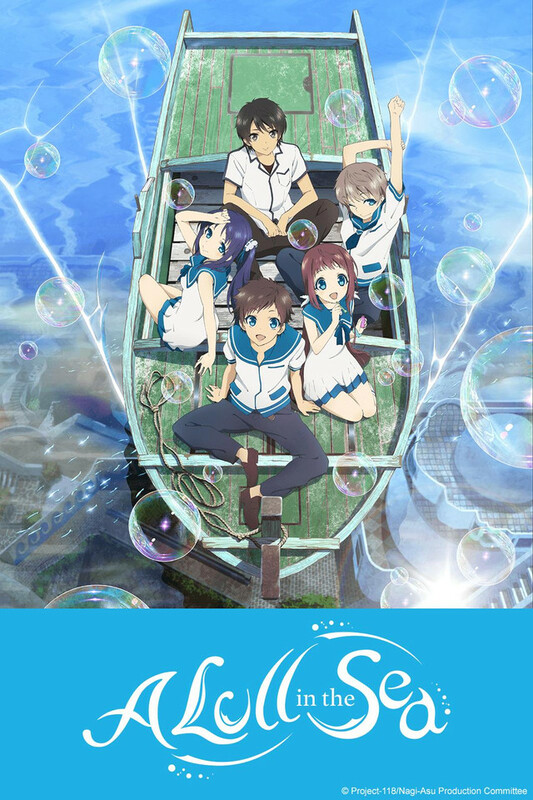 The story starts off with 4 middle school students who live in the sea. They are forced to attend school on the surface after their school closes. What follows is an immense adjusting to the life in Oshiooshi. At first, the sea and the surface are tense and upset with each other, but somehow this anime tells the tale of how they are able to finally have the two villages coincide. Alongside that, there's a growing climate change that will affect the two worlds unless something is done. This anime has it's positives and it's negatives. I'll start with the positives. Stated above. Probably the MOST beautifully animated and drawn anime I've ever seen. That made up for the negatives in the show! I can go on and on about it. I mean, just look at the screenshots and the pictures! A beachy/sea anime has to have good music that makes you feel like you're at the ocean, and A Lull in the Sea does exactly. The soundtrack is so well written, and it will have you connecting with the sounds of the ocean. For me, this one was impressive, the character development was amazing. Since this anime was focused on changing, you could tell they put a lot of effort into how the characters adapted to their new enviornment. Probably my favorite out of all the characters was Hikari. He just really changed for the better, and it was so nice to see that progression, while still mainting his stubborn character that made him lovable. They split it up into two arcs, and it was very effectively done. The pacing was great and I didn't ever feel like it was moving slowly. I do like romance, and I know this was a big part of the anime. I did enjoy the romance but at times it got me kind of irritated since most of the love was unriquitted and it just didn't seem to get anywhere. It had me feeling annoyed when things didn't work out. It was really big mess of this person liking this person, but that person liked another person and so on. Most that stuff doesn't get resoved until the end. I still found the drama and the feelings that the characters went through relatable and it did keep me hooked as I wanted to know who ened up with who. So as you can see it was a very great expirience. It's a good length and if you like romance, and drama, this will be the anime for you because there's lots of it! I hope you enjoyed my review, congrats if you read until the end haha. I'm about halfway through right now, and it's getting more and more interesting. The plot is very well done, and the concept seems very original. The artwork is also beautiful. The only real drawback for me is the characters - they are so frustrating! I don't really like any of the main cast except maybe Tsumugu Kihara (the kid from the surface), and none of the side characters stand out to me either. I get that they are adolescents and are prone to moodiness and outbursts, but come on! Even the adults in this series are temperamental and secretive. Of course, this is part of the plot, and somewhat realistic - still, very frustrating. I would like this show a lot more if I had someone to root for.